Costs of Dog Ownership | Crockett Foundation - Tag In & Help Out! The costs of dog ownership differs depending on how much we pamper our dogs and how creative we are in obtaining the goods and services needed for their upkeep. The Crockett Foundation has started helping to cover the daily living costs and periodic Veterinary care costs of pet ownership for US Military Veterans in need of help. Veterinarians recommend dogs get annual shots, and the type and number of shots depend on your lifestyle. For example if you hang out at the dog park and your dog comes in contact with other dogs frequently there’s a preventative shot for that. I’ve heard through the grapevine that some of these shots can be administered by the owners ourselves – and purchased at farm animal feed and tackle stores. Costs for a single shot at a Veterinarian office could costs upwards of $30 a piece. 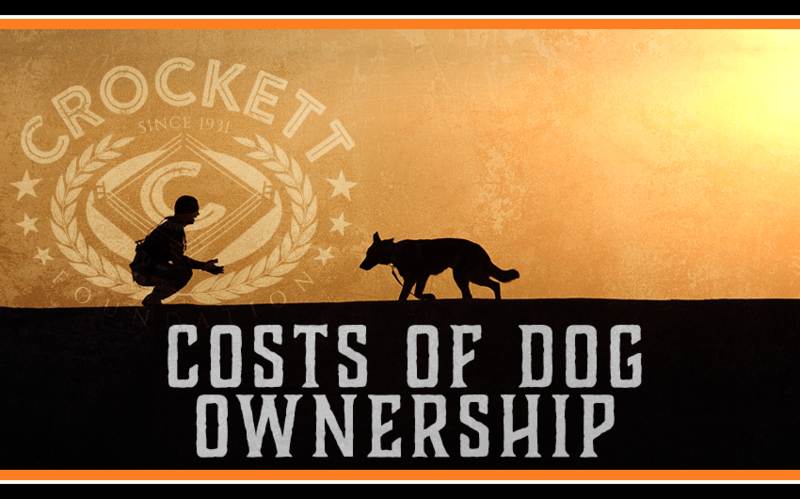 The Crockett Foundation has started helping to cover the daily living costs and periodic Veterinary care costs of pet ownership for US Military Veterans in need of help. You may read about their mission here. There are medical costs of dog ownership, but there are also costs more related to entertainment – like toys and fancy leashes that please us as humans. Our dogs sleep, and they sleep, and they sleep some more! We’ve seen fancy dog beds that are on frames – like miniature versions of human beds – and we’ve seen some that are plush with fleece. You could purchase a dog bed for anywhere from $30 to $200 or you could fold up a fluffy blanket you’ve got in the closet and use that for Fido’s bed. Similarly you could be someone who chooses not to give your dog treats between meals, or you could be someone who fills the day with tricks and treats and other rewards. Some people go as far as to make their own chicken jerky in a household kitchen dehydrator – buying premium chicken to do so. Others buy traditional store bought biscuits, which can be purchased for as little as $1 per pound for a careful shopper. Depending on the dog we accept into our family there might be costs for obedience classes. A brave or wise dog owner might purchase training books and attempt these lessons themselves. Some communities are so full of families with dogs that they hold training classes for minimal cost to residents. There are also individual one-on-one trainers who will work with your dog individually at your convenience. Training costs can include travel to classes, special treats for these sessions, and a class fee upwards of $75. US Military Veterans can enjoy support from The Crockett Foundation. Read our post about Having a Service Dog here. There are also annual costs related to lifestyle, and where we live with our dogs. Dog parks can have membership fees upward from $10 per year. When we put our dogs in the car they often shed, and when they get back into the car after a fun outing they often track-in dirty and debris. To combat this wear and tear on the car some dog owners purchase a backseat sling of sorts – which covers the back cushions and crosses over the leg space to attach to the front seat headrests. Others put a blanket on the backseat and hope that the dog will stay put, neat, and tidy. Occasionally there’s wear and tear on the car itself from transporting our dogs – in the form of torn fabric and marred finishes. And of course there is the pet deposit cost of moving into a new rental apartment. Pet deposits are often non-refundable; they are meant to cover the cost of replacing the carpeting when one tenant moves out before the next tenant moves in. Or, they might be used to disinfect the apartment if there happened to be a not-so-clean owner tenant in the place previously. Pet deposits are often upwards of $300. You may donate to the Crockett Foundation to help support the costs of training Service Dogs and helping US Military Veterans living with PTSD here.